Carthamus tinctorius is best known to gardeners as the safflower. This annual plant has a thistle like appearance that makes it unique. There are many spines on the leaves, and yellow or red flowers. Flowers appear during summer, and may appear in groups or clusters. This plant is also known as carthamine and is widely used in industry. Demand for this flower has been on the rise in Florist in Plano, Fort Wayne IN Flowers, Hillsboro Florist, Vacaville CA Flower Delivery, and Kent WA Flower Shop. This is due, in part, to the fact that Carthamus have many uses in culinary and industry as well as floral arrangements. C. tinctorius is the most widely used and recognizable of the species. It has many branches with thick leaves and thistle spines on stems. They are native to Mediterranean areas and is a part of the culture. They are susceptible to frost and must be protected in some climates. Flower heads have 15 to 20 seeds per head, making them easy to start. There are taproots that allows it to survive in very dry climates. C. lanatus is another species that is often cultivate in gardens. 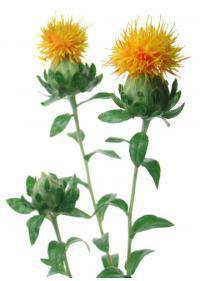 It is more commonly known as wooly distaff thistle or saffron thistle. It is often seen as a weed in many places where it has grown wild. When cultivated, it is an annual that produces thin stems and blooms. It has fine spines and fibers that have a fine cobweb appearance. The plant often mats together due to the thin spindles and stems. Full sun is often recommended for growing many carthamus species. If full sun is not available, partial shade can be used in gardens. Full shade should be avoided as it limits growth of stems and blooms. Seeds are often sown directly into the ground after the last frost. Established plants may also be used if they are available locally. Established plants may be started later than the seeds are added. Spacing up to ten inches between plants is ideal for plantings. If they become too dense they may be thinned or dug up and replanted. This can prevent overcrowding that can choke roots and limit blooms. Many species can tolerate drought conditions making watering flexible. To produce better plants, watering should be done regularly however. Heavy watering should be avoided to prevent moisture rot of plants. Safflowers are often grown for their seeds, which are heavily used. The seeds are often used in birdfood instead of sunflower seeds. This is because many squirrels will not eat the seeds and ignore them. The oil made from the plants is also used in culinary preparations. It was originally used to make yellow and orange dyes for materials. This was common until less expensive dye colorings were available. The oil is colorless and similar to sunflower oil in nutrition. This makes it an affordable and viable substitute for cooking food. It is also taken as a nutritional supplement for better health. This flower is often thought to represent attractiveness to others. This is due to its sticky webbing and sharp spines on the stems. It was used in folklore to attract and "catch" good luck and love. It was commonly used as a gift to attract a new lover or marriage. The yellow blooms were also associated with happiness and good luck. This made carthamus flowers an important part of folklore meanings.